Some fear we are meddling with forces too powerful for human control. In Star Trek II The Wrath of Khan, a device known as Genesis is deployed from a starship. Though repurposed as a weapon by the evil Khan, it was originally intended to terraform a dead planet, in order to make it inhabitable. Today, there are scientists who believe this may be a good idea. 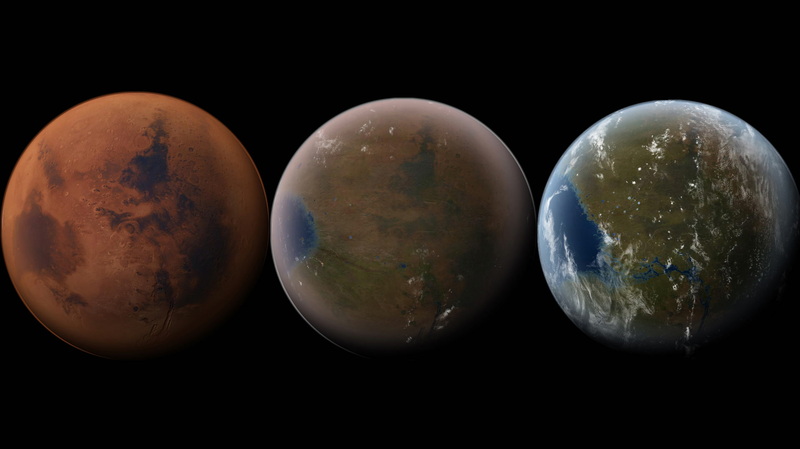 Now that colonizing Mars has gone from promising concept to foregone conclusion, some are suggesting we terraform the red planet. Others peg Venus as a good candidate. One reason, someday our home planet will no longer be livable. Even if climate change or an apocalyptic war doesn’t wipe us out, in about five billion years or so, our sun is expected to turn into a red giant, swell massively and vaporize the Earth, along with other planets in our solar system. If humanity has any chance of survival, it’s by colonizing the galaxy and beyond. Michael Mautner is a research chemistry professor at Virginia Commonwealth University. He argues that not only is it a moral imperative to seed the galaxy and perhaps the universe with life, but it can be done with current technology. Artist depiction of the sun turning into a red giant and coming to swallow the Earth. In a 2010 report published in the Journal of Cosmology, Mautner claims that by depositing a wide variety of microorganisms and certain hardy, multicellular ones, on planets and proto-planets across our galaxy and others, we should, in time, be able to create livable planets, much like Earth. These organisms would have to be able to survive in a harsh atmosphere, in order to someday create Earth-like conditions. Mautner believes there may be hundreds of planets beyond our solar system that are good candidates, perhaps including the recently discovered, “Earth next door.” So far, 3,500 exoplanets have been identified. To be a good candidate, a planet must be in the “goldilocks zone,” or a particular distance from a white star. Its chemical makeup has to be right too with conditions to support liquid water. If it has all of this, a planet is dubbed “transiently habitable.” Mautner himself has identified several good candidates, as well as gas and dust clouds surrounding fledgling stars, which may form suitable planets, someday. Ships with solar sails would be used to transport terraforming devices to other planets. Utilizing radiation from starlight, these sails can guide spacecraft through the solar system and beyond. That’s important, as it may take hundreds, thousands, or even millions of years for any particular ship to reach a suitable destination. Conceptualization of a solar sail. Image by Kevin Gill from Nashua, NH, United States - Solar Sail, CC BY-SA 2.0. Hundreds of tons of microbes would be required for mission success. One ship would contain, all told, around 100,000 carefully selected organisms, crammed into tiny capsules, just waiting for their chance to start building a proto-Earth. Cyanobacteria are just one example of the type that might be used. These take in ammonia, carbon dioxide and other toxic gasses, and give off oxygen, which would help build an atmosphere. The project is estimated to cost about a billion dollars. For that, dozens of planets could potentially be seeded. A scaled down version targets planets only in our own solar system and launches the ships from space, making things easier and decreasing costs. Another plan was recently outlined by theoretical physicist Claudius Gros. Gros hails from Goethe University in Frankfurt, Germany. In Gros’s report, published in the journal Astrophysics and Space Science, he argues that we could use smaller spacecraft, imbued with artificial intelligence, to target those planets best suited for sustaining life. He says that such technology will be available within the next couple of decades or so. In this vision, small spacecraft travelling at speeds of 60,000 kilometers per second (37,280 miles per second), scan the galaxy and beyond, searching for planets to target. When one looks right, a ship orbits it and examines it further, to determine whether or not to seed it. The criteria would be if life could be sustained there for the next hundred billion years, or more. If the ship decided to move forward, an onboard lab would begin producing a variety of microbes. These would be genetically altered to survive and thrive in harsh conditions. Once created, these bacteria would be stuffed into tiny, nano-size capsules. The spacecraft would hover above the planet for hundreds of years, raining down seeds onto the surface continuously, or at least until signs of life could be found. Here, Gros is piggybacking on the theory of panspermia, which states that bacteria may have clung to asteroids that landed on Earth and jumpstarted life. His hope in this plan is to recreate the Cambrian explosion. This is when, some 542 million years ago, life gained a foothold on our planet. Other experts warn that life may become fickle and less willing to take root on other planets. With such plans, it is of course all theoretical at this point. These proposed missions also raise a lot of fundamental and philosophical questions. What would happen if a ship mistakenly seeded a planet already containing life? It might cause the destruction of native species or even the downfall of an entire ecosystem. Under current law, it is illegal to drastically change other moons or planets, for this very reason. Terraforming other planets may have disastrous but as of yet unforeseen consequences. Some critics argue that Gros’s “Genesis Project” will take too much energy. The vehicle needs to make a number of stops. So it may take centuries before it is successful. Gros counters that we have time. Others say they see little benefit in the plan. Gros’s big reason for doing so is to see if intelligent life will pop out of the other end. That would only take approximately 500 million years or so. His secondary concern oddly enough, is saving humanity. One theory making its rounds across the internet is that Earth could have been seeded in such a manner by a now extinct alien race, leading to us. But scientists are quick to point out that there is no evidence to support this claim. It also brings up fundamental questions about our role in the universe. Would such an exercise rest on hubris or is it our next logical evolutionary step?